I am going to take a brief respite from the Pittsfield recipe series to call attention to the amazing dinner we cooked up tonight in Siesta Key, Florida. I have been on VACATION and clean cooking comes with me. It’s an annual event for my girls and I to trek down here for sun, sand, and swimming. Known for white sandy beaches and teeny tiny bikinis, I have been coming here since middle school. I am always spoiled – I have had fresh fish every day – the seasonal produce and sea food abound so we are taking advantage of the citrus, berries, and fresh fish fillets from the local market! Tonight, ever-challenged by my family to make “clean” meals, I raided the fridge and pantry to come up with this chicken marinade for my parents, grandparents, and girls. My dad is the grill master and barkeep so he made the chicken once it had set in the marinade and he also poured the drinks! The grill is oceanside (and in close proximity to the hot tub) so half the fun is making the food at sunset, maragarita in hand, and tonight it turned out perfectly. Try this recipe the next time you are wanting an escape to someplace tropical. Be sure to pair this meal with a sangria or sweet wine to really bring out the tangy flavors of the food. 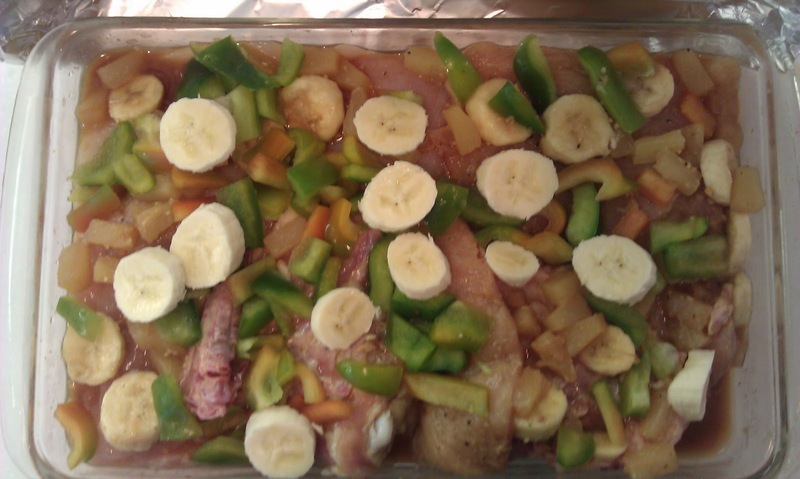 Soak ingredients in the marinade for at least two hours. 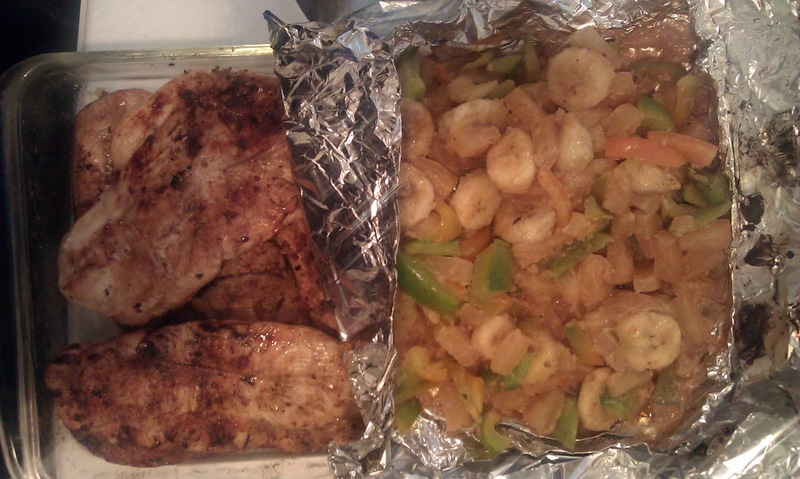 Chicken on the grill and the veggies and fruit on the grill on a piece of heavy duty tin foil. Cook until tender and juicy (or until your drink runs dry). I put the chicken over some cooked quinoa and loaded the top with the fruit and veggies like salsa. It was delicious! Get creative with your cooking. It’s fun to try new flavors. We even decided that we’d try some strawberries next time in the marinade to add something extra sweet. Oooo yummy!!! This one is a must to try! !